The Grant Memorial half dollar was designed by Laura Gardin Fraser, the wife of James Earle Fraser (best known for designing the Buffalo nickel). The obverse depicts Ulysses S. Grant and the reverse shows his birthplace in Point Pleasant, Ohio. It was produced in 1922. The Ulysses S. Grant Centenary Association, formed in 1921, aimed to construct monuments in recognition of President Ulysses S. Grant's contributions and impact on the country. The group called for minting a Grant commemorative gold dollar in order to finance their goals. Although the group sought the minting of up to 200,000 gold dollars, before the bill was passed on February 2, 1922, the bill was emended to call for the minting of only 10,000 gold dollars, as well as up to 250,000 half dollars. The commemorative would be designed by Laura Gardin Fraser, who had already won acclaim for her design of the Alabama Centennial half dollar the previous year, which had also made her the first woman designer of a United States coin. Her initial "G", for her maiden name, Gardin, appears below Grant's bust, between the two dates. Both the commemorative half dollar and gold dollar used the same set of designs. A variety of the Grant Memorial half dollar featured a star above the name "Grant" on the right side of the coin, similar to how the sponsors of the Missouri and Alabama Centennial half dollars had included a symbol on a minority of coins minted. Originally, this was originally only to apply to the Grant Memorial gold dollars, but due to a mix-up at the mint, 5,000 of the half dollars also ended up with a star. Of the two varieties of the Grant Memorial half dollar, 67,405 coins without the star were minted, while of the 5,000 coins with the star, 750 were melted. ^ "Grant Half Dollar". Retrieved 10 April 2019. ^ a b c "1922 Star Grant 50C MS Silver Commemoratives". Retrieved 9 April 2019. Several presidents of the United States have appeared on currency. The President of the United States has appeared on official banknotes, coins for circulation, and commemorative coins in the United States, the Confederate States of America, the Philippine Islands, the Commonwealth of the Philippines and around the world. The Monroe Doctrine Centennial half dollar was a fifty-cent piece struck by the United States Bureau of the Mint. 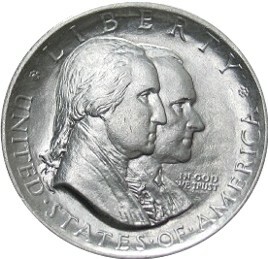 Bearing portraits of former U.S. Presidents James Monroe and John Quincy Adams, the coin was issued in commemoration of the centennial of the Monroe Doctrine and was produced at the San Francisco Mint in 1923. Sculptor Chester Beach is credited with the design, although the reverse closely resembles an earlier work by Raphael Beck. The California Diamond Jubilee half dollar was a United States commemorative silver fifty-cent piece struck at the San Francisco Mint in 1925. It was issued to celebrate the 75th anniversary of California statehood. The Fort Vancouver Centennial half dollar, sometimes called the Fort Vancouver half dollar, is a commemorative fifty-cent piece struck by the United States Bureau of the Mint in 1925. The coin was designed by Laura Gardin Fraser. Its obverse depicts John McLoughlin, who was in charge of Fort Vancouver from its construction in 1825 until 1846. From there, he effectively ruled the Oregon Country, on behalf of the Hudson's Bay Company. The reverse shows an armed frontiersman standing in front of the fort.